Thank you to all who generously supported Inter Care’s The Big Give Campaign 2017, raising £10,967.50. This enabled us to provide vital medical aid to 12 of our partner health units in rural sub-Saharan Africa. We have partnered again with the Big Give Christmas Challenge 2018, we hope this will be our most successful campaign with a target of £12,850. The campaign offers donors a unique opportunity to double their donations to their chosen charity. So, any donation you make to Inter Care during the campaign, whatever the amount, will be worth twice as much, which means we can send even more medical aid to our partner health units! By donating through the Big Give (information on how found in this leaflet), you will support Inter Care in providing its partner health units with vital outreach medical aid. The Big Give Christmas challenge is the UK’s largest online match funding campaign, which is ran by the Big Give online donation platform. Donations are matched by a Pledge; this is provided by a supporter of the charity. The Big Give Christmas Challenge 2018 opens at 12pm on the 27th November and closes at 12pm on Friday 7th December. In order for your donation to be doubled, you must donate between this time period. All donations must be made via the Big Give online platform. The medical aid Inter Care provides ensures free healthcare is available to the most disadvantaged patients, many of whom would not otherwise receive treatment. On a monitoring and evaluation visit in October 2017 Dr Helen Cox, Julie-Anne Smith and Kathryn Garnett (Trustee) visited St Peter’s Hospital, Malawi. 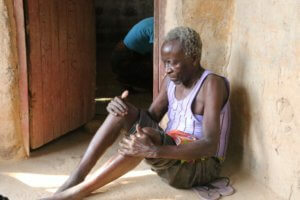 During an outreach clinic visit, they met an elderly man Michael at his home. He lived with his wife and extended family in a typical mud brick hut in the village of Khuyu, 20 minutes’ walk away from St Peter’s. Before his illness, Michael was a successful fisherman and now had to rely on the support of his son. He was clearly in a great deal of pain, particularly in his legs, due to bone cancer. He was immobile and could only move by shuffling on his bottom, supported by his wife. Michael had ran out of Ibuprofen, which was his only source of pain relief and could not afford a new supply. With the support of Outreach clinics, it means Peter does not have to travel and endure unnecessary pain and still receive vital end of life care. Information on how to donate can be found in thisThe Big Give leaflet. Donations only made between 27th November 12pm – 4th December 12pm via The Big Give platform, will have the chance to be doubled.